Free AVI/MPEG/WMV/MP4/FLV Video Joiner, a perfect easy-to-use video joining tool, allows the users to easily and quickly join more than one video file of different formats to one file of a specified format including AVI, MP4, FLV, WMV, etc. The preset configuration helps you control the output quality precisely. No matter you are an experienced user or a beginner, it works so easily and conveniently for users. ...... You can add an unlimited number of video files as you like to the list and easily rearrange their order if needed. With batch processing, it will save you much time. Additionally, presets of the video resolution & video quality are provided and the wizard mode guides all the operations. * Join video of same or different formats to AVI, MP4, FLV, 3GP, etc. 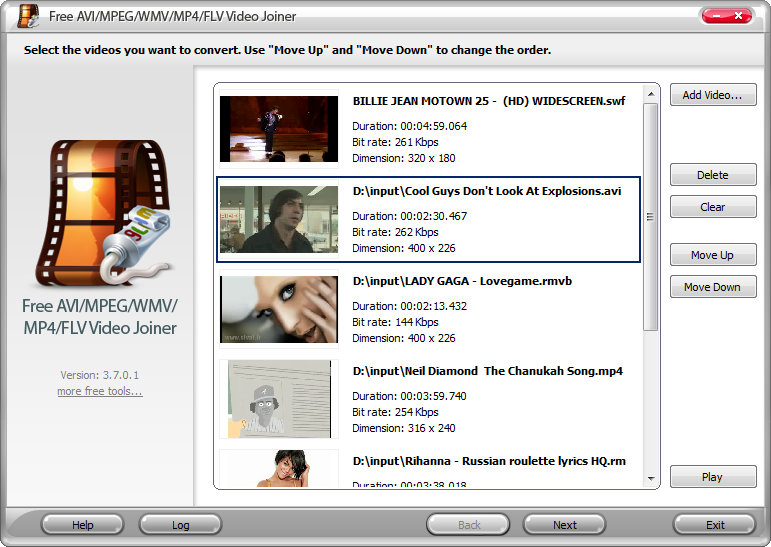 Easy AVI/MPEG/RM/WMV Joiner is an easy to use solution for video joining. a Major upgraded version with support of mp4/mov/mpeg2/FLV/Matroska media etc. Qweas is providing links to Free AVI/MPEG/WMV/MP4/FLV Video Joiner 3.9.3 as a courtesy, and makes no representations regarding Free AVI/MPEG/WMV/MP4/FLV Video Joiner or any other applications or any information related thereto. Any questions, complaints or claims regarding this application Free AVI/MPEG/WMV/MP4/FLV Video Joiner 3.9.3 must be directed to the appropriate software vendor. You may click the publisher link of Free AVI/MPEG/WMV/MP4/FLV Video Joiner on the top of this page to get more details about the vendor.